Get inspired by these incredible aviators who have challenged themselves and achieved their dreams though hard work, determination and perseverance. Will you join them? British aviatrix Tracey Curtis-Taylor followed in Amy Johnson's footsteps and completed an epic solo flight from the UK to Australia. Tracey’s flight marks the beginning of a wonderful year for women in aviation. This flight is historic for many reasons – not only because it is an epic solo flight across continents which is a challenge in itself but because Tracey dared to dream and then worked hard to make that dream a reality. I was lucky enough to meet Tracey and to get up close and personal to her beautiful Boeing Stearman in 2015 and Tracey is incredibly supportive and keen to share her adventures to inspire others. The skills of determination, perseverance and hard work and effort are life skills we want young people to embrace and parents and schools to teach across all walks of life. The sky is no longer the limit and we want more and more young people to reach for their dreams. Ultimately I believe that we can use aviation as a tool to raise aspirations. Tracey’s adventure and organisations working together such as the British Women Pilots' Association and Amy Johnson are there to encourage young people – particularly young women – to believe in themselves and to know that there are no limits or barriers to achieving anything they set their mind to. Blue skies all the way! 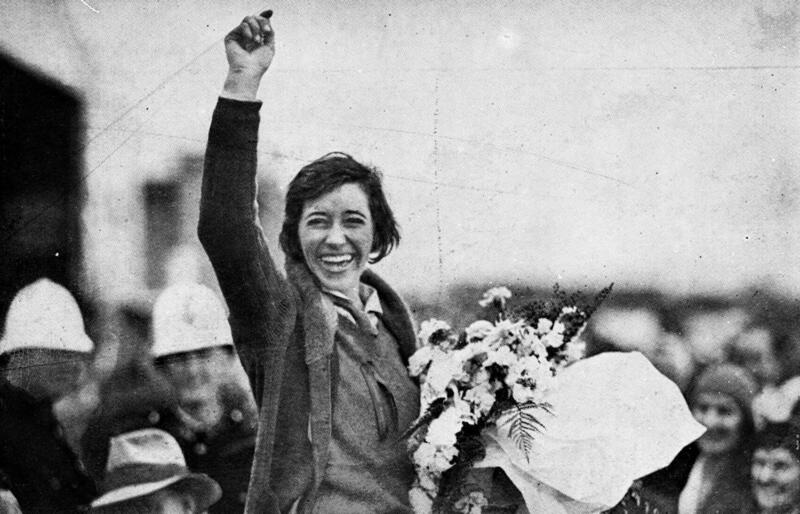 Amy Johnson was the first woman to have flown solo from England to Australia in May 1930. She was born on July 1st 1903 in Kingston - upon - Hull England. She was very bright and was able to go to university, which was quite uncommon in those days. She obtained her BA degree in Economics and worked as a secretary as she found it hard to get a job worthy of her skills. Then one fine day she came across a notice saying "London Aeroplane Club Private" she ignored the word private and went in with an overwhelming desire to learn to fly. She not only obtained a private pilots license in 1929, she also obtained an engineers license the following year. A few months later she made her first solo flight from England to Australia. Amelia Earhart was an American aviation pioneer and author and the first female aviator to fly solo across the Atlantic Ocean. She was born in Atchison, Kansas. Her father was a lawyer and her grandfather a former federal judge, and leading citizen of Atichison. Around 1919, she had her first major flying experience watching a display by a World War 1 race. She commented that something captivated her about flying and she developed a deep seated desire to fly. She received the U.S. Distinguished Flying Cross and set many other records. She was a supporter of equal rights for women and saw her role to inspire other women and give the confidence they could achieve the same as men. In 1937, aged just 40 years old, Amelia Earhart disappeared in the Pacific Ocean on a solo flight attempting to circumnavigate the globe. Bessie Coleman made history! She was born January 26, 1892 in Atlanta, Texas. Bessie Coleman was the tenth of thirteen children in her family. Bessie really wanted to make something of herself, so in 1920 she moved to France and she went to aviation school there. On June 15, 1921 Bessie became the first black woman to ever earn a license from the prestigious Federation Aeronautique Internationale in France. When she returned to New York she was famous. Bessie broke the barriers for African Americans and for women with her spectacular flying and her speeches.